The Eastern and Southern African Trade and Development Bank (TDB) and USAID's Power Africa initiative have today signed a memorandum of understanding (MoU) that will finance power projects in 22 African countries. 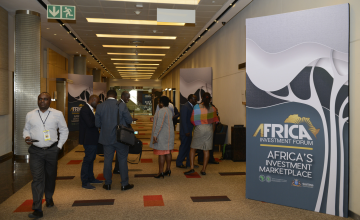 The memorandum was signed at African Development Bank's inaugural Africa Investment Forum, where emphasis on investment is at the core of tens of transactions anticipated to take place. At the signing, the Trade and Development Bank's President and Chief Executive, Mr. Admassu Tadesse, said, "TDB is very pleased to deepen its existing partnership with USAID in further support of the Power Africa Initiative, which resonates strongly with TDB's strategy and mandate. We are proud to count USAID among our growing number of cooperating trade and development finance partners in the US." The Senior Deputy Assistant Administrator of USAID's Africa Bureau, Mr. Ramsey Day, said, "we are excited to welcome TDB as our 18th development partner. We applaud the Bank's commitment to increase its exposure in the energy sector from its current 8% to 20% of its portfolio, the equivalent of bringing $400 million new dollars towards power sector financing".